The Elite Supreme Fleece Lined Four Layer Truck Cover. Covers for Mini, Mid Size and Full Size Pick Ups. The Elite Supreme Pick Up Truck Cover itself is made up of 3 Durable Layers PLUS a 4th Ultra Soft Fleece Lining to ensure your vehicles surface finish stays in pristine condition. There are two tough yet soft layers of polypropylene, which is an oil based material, with a layer of micro-porous film sandwiched between them to ensure breathability. With the added Fleece Lining there is nothing better to help protect your vehicles finish. Ultimately, this allows for superior rain protection along with the ability for moisture to evaporate through the cover. The material is chemically treated to help prevent UV damage and is also great protection against bird droppings, the effects of acid rain, damage from tree sap, dust, outright dirt and other harmful pollutants. Finally, we weld the seams Ultra-Sonically instead of the use of stitching which ensure the seams wont leak. Free Storage Bag and FREE Cable Lock which is a $10.00 value! Cover dimensions are 15' L x 65" W x 58" H and is great for Mini Pick Up Trucks before 1980 with a Regular Cab with a Regular Bed. 3 Year Warranty The suggested retail price is an economical $150.00 to $200.00. The Elite Supreme Pick Up Truck Cover itself is made up of 3 Durable Layers PLUS a 4th Ultra Soft Fleece Lining to ensure your vehicles surface finish stays in pristine condition. There are two tough yet soft layers of polypropylene, which is an oil based material, with a layer of micro-porous film sandwiched between them to ensure breathability. With the added Fleece Lining there is nothing better to help protect your vehicles finish. Ultimately, this allows for superior rain protection along with the ability for moisture to evaporate through the cover. The material is chemically treated to help prevent UV damage and is also great protection against bird droppings, the effects of acid rain, damage from tree sap, dust, outright dirt and other harmful pollutants. Finally, we weld the seams Ultra-Sonically instead of the use of stitching which ensure the seams wont leak. Free Storage Bag and FREE Cable Lock which is a $10.00 value! Cover dimensions are 16' L x 65"W x 58" H and is for Mini Pick Up Trucks with a Regular Cab and a Regular Bed. 3 Year Warranty. Suggested retail price is an economical $150.00 to $200.00. The Elite Supreme Pick Up Truck Cover itself is made up of 3 Durable Layers PLUS a 4th Ultra Soft Fleece Lining to ensure your vehicles surface finish stays in pristine condition. There are two tough yet soft layers of polypropylene, which is an oil based material, with a layer of micro-porous film sandwiched between them to ensure breathability. With the added Fleece Lining there is nothing better to help protect your vehicles finish. Ultimately, this allows for superior rain protection along with the ability for moisture to evaporate through the cover. The material is chemically treated to help prevent UV damage and is also great protection against bird droppings, the effects of acid rain, damage from tree sap, dust, outright dirt and other harmful pollutants. Finally, we weld the seams Ultra-Sonically instead of the use of stitching which ensure the seams wont leak. Free Storage Bag and FREE Cable Lock which is a $10.00 value! Cover dimensions are 17'6" L x 65"W x 58" H and is for Mini to Mid Size Pick Up Trucks with a Regular Cab and a Regular Bed. 3 Year Warranty. Suggested retail price is an economical $150.00 to $200.00. The Elite Supreme Pick Up Truck Cover itself is made up of 3 Durable Layers PLUS a 4th Ultra Soft Fleece Lining to ensure your vehicles surface finish stays in pristine condition. There are two tough yet soft layers of polypropylene, which is an oil based material, with a layer of micro-porous film sandwiched between them to ensure breathability. With the added Fleece Lining there is nothing better to help protect your vehicles finish. Ultimately, this allows for superior rain protection along with the ability for moisture to evaporate through the cover. The material is chemically treated to help prevent UV damage and is also great protection against bird droppings, the effects of acid rain, damage from tree sap, dust, outright dirt and other harmful pollutants. Finally, we weld the seams Ultra-Sonically instead of the use of stitching which ensure the seams wont leak. Free Storage Bag and FREE Cable Lock which is a $10.00 value! Cover dimensions are 17'5" L x 65"W x 58" H and is for Mini to Mid Size Pick Up Trucks with an Extended Cab and a Regular Bed. 3 Year Warranty. Suggested retail price is an economical $150.00 to $200.00. The Elite Supreme Pick Up Truck Cover provides all season indoor and outdoor protection for your vehicle. This nearly impenetrable 4 layer fabric is fleece lined to protect fine automotive finishes. Its high water resistance makes it virtually waterproof, yet breathable. The Elite Supreme is great for rain and snow protection. The fabric naturally resists rot and mildew. Its seams are ultrasonically welded to ensure the cover doesn't leak. The material is also UV treated for sun and heat protection. An elastic front and rear hem ensures a snug fit. The Elite Supreme Pick Up Truck Cover comes with a FREE cable lock, storage pouch and antenna patch. Cover dimensions are 17.5' L x 65"W x58" H and is for Mini to Mid Size Pick Up Trucks with a Crew Cab or Extended Cab and a Regular Bed. 3 YEAR WARRANTY! Suggested Retail Price: $150.00 to $200.00. The Elite Supreme Pick Up Truck Cover provides all season indoor and outdoor protection for your vehicle. This nearly impenetrable 4 layer fabric is fleece lined to protect fine automotive finishes. Its high water resistance makes it virtually waterproof, yet breathable. The Elite Supreme is great for rain and snow protection. The fabric naturally resists rot and mildew. Its seams are ultrasonically welded to ensure the cover doesn't leak. The material is also UV treated for sun and heat protection. An elastic front and rear hem ensures a snug fit. The Elite Supreme Pick Up Truck Cover comes with a FREE cable lock, storage pouch and antenna patch. Cover dimensions are 17'6" L x 65" W x 58" H and is for Mid Size Pick Up Trucks with a Crew Cab w/ an Extra Short Bed. Works great for a Honda Ridgeline and Ford Explorer Sport Trac. 3 YEAR WARRANTY! Suggested Retail Price: $150.00 to $200.00. The Elite Supreme Pick Up Truck Cover provides all season indoor and outdoor protection for your vehicle. This nearly impenetrable 4 layer fabric is fleece lined to protect fine automotive finishes. Its high water resistance makes it virtually waterproof, yet breathable. The Elite Supreme is great for rain and snow protection. The fabric naturally resists rot and mildew. Its seams are ultrasonically welded to ensure the cover doesn't leak. The material is also UV treated for sun and heat protection. An elastic front and rear hem ensures a snug fit. 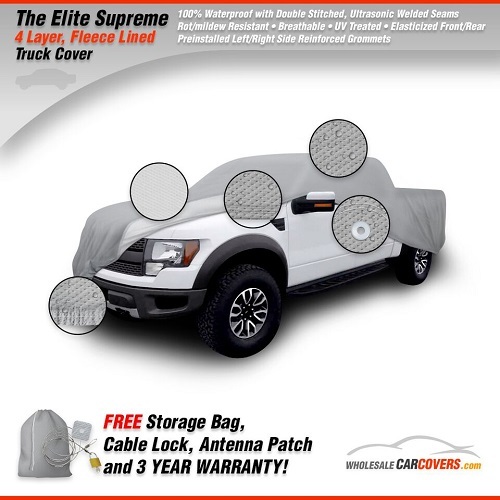 The Elite Supreme Pick Up Truck Cover comes with a FREE cable lock, storage pouch and antenna patch. Cover dimensions are 18.6' L x 65" W x58" H and is for Mid Size Pick Up Trucks with a Crew Cab and a Regular Bed. 3 YEAR WARRANTY! Suggested Retail Price: $150.00 to $200.00. The Elite Supreme Pick Up Truck Cover provides all season indoor and outdoor protection for your vehicle. This nearly impenetrable 4 layer fabric is fleece lined to protect fine automotive finishes. Its high water resistance makes it virtually waterproof, yet breathable. The Elite Supreme is great for rain and snow protection. The fabric naturally resists rot and mildew. Its seams are ultrasonically welded to ensure the cover doesn't leak. The material is also UV treated for sun and heat protection. An elastic front and rear hem ensures a snug fit. The Elite Supreme Pick Up Truck Cover comes with a FREE cable lock, storage pouch and antenna patch. Cover dimensions are 18.5' L x 65" W x 58" H and is for Mid Size Pick Up Trucks with a Crew Cab and a Short Bed. 3 YEAR WARRANTY! Suggested Retail Price: $150.00 to $200.00. Cover dimensions are 17.8' L x 75"W x 64" H and is for a Classic Full Size pick up truck w/ a regular cab and a long bed. The Elite Supreme Pick Up Truck Cover provides all season indoor and outdoor protection for your vehicle. This nearly impenetrable 4 layer fabric is fleece lined to protect fine automotive finishes. Its high water resistance makes it virtually waterproof, yet breathable. The Elite Supreme is great for rain and snow protection. The fabric naturally resists rot and mildew. Its seams are ultrasonically welded to ensure the cover doesn't leak. The material is also UV treated for sun and heat protection. An elastic front and rear hem ensures a snug fit. The Elite Supreme Pick Up Truck Cover comes with a FREE cable lock, storage pouch and antenna patch. 3 YEAR WARRANTY! Suggested Retail Price: $150.00 to $200.00. Cover dimensions are 17.5' L x 75"W x 64" H and is for a Full Size pick up truck w/ a regular cab and a short bed. This cover is for full size pick up trucks. The Elite Supreme Pick Up Truck Cover provides all season indoor and outdoor protection for your vehicle. This nearly impenetrable 4 layer fabric is fleece lined to protect fine automotive finishes. Its high water resistance makes it virtually waterproof, yet breathable. The Elite Supreme is great for rain and snow protection. The fabric naturally resists rot and mildew. Its seams are ultrasonically welded to ensure the cover doesn't leak. The material is also UV treated for sun and heat protection. An elastic front and rear hem ensures a snug fit. The Elite Supreme Pick Up Truck Cover comes with a FREE cable lock, storage pouch and antenna patch. 3 YEAR WARRANTY! Suggested Retail Price: $150.00 to $200.00. Cover dimensions are 19.5" L x 75"W x 64" H and is for a Full Size pick up truck w/ a regular cab and a long 8' bed. This cover is for full size pick up trucks. The Elite Supreme Pick Up Truck Cover provides all season indoor and outdoor protection for your vehicle. This nearly impenetrable 4 layer fabric is fleece lined to protect fine automotive finishes. Its high water resistance makes it virtually waterproof, yet breathable. The Elite Supreme is great for rain and snow protection. The fabric naturally resists rot and mildew. Its seams are ultrasonically welded to ensure the cover doesn't leak. The material is also UV treated for sun and heat protection. An elastic front and rear hem ensures a snug fit. The Elite Supreme Pick Up Truck Cover comes with a FREE cable lock, storage pouch and antenna patch. 3 YEAR WARRANTY! Suggested Retail Price: $150.00 to $200.00. Cover dimensions are 15'8" L x 75"W x 64" H and is for a Classic Full Size pick up truck w/ a regular cab and a short bed. This cover is for full size pick up trucks. The Elite Supreme Pick Up Truck Cover provides all season indoor and outdoor protection for your vehicle. This nearly impenetrable 4 layer fabric is fleece lined to protect fine automotive finishes. Its high water resistance makes it virtually waterproof, yet breathable. The Elite Supreme is great for rain and snow protection. The fabric naturally resists rot and mildew. Its seams are ultrasonically welded to ensure the cover doesn't leak. The material is also UV treated for sun and heat protection. An elastic front and rear hem ensures a snug fit. The Elite Supreme Pick Up Truck Cover comes with a FREE cable lock, storage pouch and antenna patch. 3 YEAR WARRANTY! Suggested Retail Price: $150.00 to $200.00. Cover dimensions are 19.5" L x 75"W x 64" H and is for a Full Size pick up truck w/ a extended cab and a short bed. This cover is for full size pick up trucks. The Elite Supreme Pick Up Truck Cover provides all season indoor and outdoor protection for your vehicle. This nearly impenetrable 4 layer fabric is fleece lined to protect fine automotive finishes. Its high water resistance makes it virtually waterproof, yet breathable. The Elite Supreme is great for rain and snow protection. The fabric naturally resists rot and mildew. Its seams are ultrasonically welded to ensure the cover doesn't leak. The material is also UV treated for sun and heat protection. An elastic front and rear hem ensures a snug fit. The Elite Supreme Pick Up Truck Cover comes with a FREE cable lock, storage pouch and antenna patch. 3 YEAR WARRANTY! Suggested Retail Price: $150.00 to $200.00. Cover dimensions are 21' L x 75"W x 64" H and is for a Full Size pick up truck w/ an extended cab and a long bed. This cover is for full size pick up trucks. The Elite Supreme Pick Up Truck Cover provides all season indoor and outdoor protection for your vehicle. This nearly impenetrable 4 layer fabric is fleece lined to protect fine automotive finishes. Its high water resistance makes it virtually waterproof, yet breathable. The Elite Supreme is great for rain and snow protection. The fabric naturally resists rot and mildew. Its seams are ultrasonically welded to ensure the cover doesn't leak. The material is also UV treated for sun and heat protection. An elastic front and rear hem ensures a snug fit. The Elite Supreme Pick Up Truck Cover comes with a FREE cable lock, storage pouch and antenna patch. 3YEAR WARRANTY! Suggested Retail Price: $150.00 to $200.00. Cover dimensions are 21'L x 75" W x 64" H and is for a Full Size pick up truck w/ a crew cab and a 6.5ft bed. This cover is for full size pick up trucks. The Elite Supreme Pick Up Truck Cover provides all season indoor and outdoor protection for your vehicle. This nearly impenetrable 4 layer fabric is fleece lined to protect fine automotive finishes. Its high water resistance makes it virtually waterproof, yet breathable. The Elite Supreme is great for rain and snow protection. The fabric naturally resists rot and mildew. Its seams are ultrasonically welded to ensure the cover doesn't leak. The material is also UV treated for sun and heat protection. An elastic front and rear hem ensures a snug fit. The Elite Supreme Pick Up Truck Cover comes with a FREE cable lock, storage pouch and antenna patch. 3 YEAR WARRANTY! Suggested Retail Price: $150.00 to $200.00. Cover dimensions are 22' L x 75" W x 64" H and is for a Full Size pick up truck w/ a crew cab and a 8ft bed. This cover is for full size pick up trucks. The Elite Supreme Pick Up Truck Cover provides all season indoor and outdoor protection for your vehicle. This nearly impenetrable 4 layer fabric is fleece lined to protect fine automotive finishes. Its high water resistance makes it virtually waterproof, yet breathable. The Elite Supreme is great for rain and snow protection. The fabric naturally resists rot and mildew. Its seams are ultrasonically welded to ensure the cover doesn't leak. The material is also UV treated for sun and heat protection. An elastic front and rear hem ensures a snug fit. The Elite Supreme Pick Up Truck Cover comes with a FREE cable lock, storage pouch and antenna patch. 3 YEAR WARRANTY! Suggested Retail Price: $150.00 to $200.00. Cover dimensions are 19'6" L x 75"W x 64" H and is for a Full Size pick up truck w/ a crew cab and short 5'6" bed. The Elite Supreme Pick Up Truck Cover provides all season indoor and outdoor protection for your vehicle. This nearly impenetrable 4 layer fabric is fleece lined to protect fine automotive finishes. Its high water resistance makes it virtually waterproof, yet breathable. The Elite Supreme is great for rain and snow protection. The fabric naturally resists rot and mildew. Its seams are ultrasonically welded to ensure the cover doesn't leak. The material is also UV treated for sun and heat protection. An elastic front and rear hem ensures a snug fit. The Elite Supreme Pick Up Truck Cover comes with a FREE cable lock, storage pouch and antenna patch. 3 YEAR WARRANTY! Suggested Retail Price: $150.00 to $200.00.